Trading bitcoin can be appealing to many investors. But, the mechanics of trading bitcoin can be daunting to many. It’s not as simple to buy a bitcoin as it is to buy a stock, and that fact might mean some investors are ignoring the opportunities in cryptocurrencies. Futures markets could provide a simpler way for investors to access the crypto markets. Futures markets are leveraged markets where investors post a small amount of money to benefit from the movements of a financial instrument like a ten year Treasury note or a physical commodity like coffee. Many investors consider futures to be risky. And, they are risky. But, all investments are risky. And just like in the stock market one of the best tools for managing risk is education and knowledge. Informed investors can avoid many of the pitfalls of many markets. To begin with, it is important to note that futures are considered to be among the riskiest of all investments. 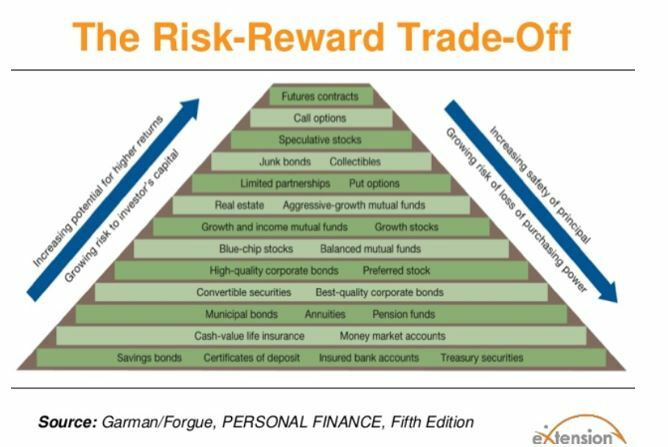 That means they also offer significant potential for rewards since risk and potential rewards are directly correlated. One example of the market is detailed at NerdWallet.com, “An airline company may want to lock in jet fuel prices to avoid an unexpected increase. So it buys a futures contract agreeing to buy 1 million gallons of fuel, taking delivery 90 days in the future, at a price of $3 per gallon. Someone else, a fuel distributor perhaps, wants to ensure that it has a steady market for fuel. It wants to protect against an unexpected decline in fuel prices, so it will enter into a futures contract. It agrees to sell that 1 million gallons of fuel, delivering it in 90 days, at a price of $3 per gallon. In the futures markets, speculators can also participate and that includes individuals. An individual might believe that the price of fuel is set to decline. There might be a contract for 100,000 gallons of fuel that is trading at $3.10. The individual could trade that contract to benefit from their opinion. Now, futures are leveraged which means individuals trade with just a fraction of the funds. For example, in the Treasury market, an investor might need just $5,000 to benefit from $100,000 worth of Treasuries. If the price moves by 1%, the $1,000 gain or loss will be a 20% return on the individual’s leveraged investment. In the simplest terms, this is the appeal and risk of the market. Futures on bitcoins have been available at exchanges since late last year. These contracts allow for leveraged exposure to the markets. This could be interesting to many individual investors because futures can be traded at many brokerage firms. It can be relatively simple to open a futures account or to add futures trading privileges to an existing broker. The transaction is done in U. S. dollars and does not require access to online wallets or specialized hardware as many crypto accounts do. The contract available through CME is for 5 bitcoins and requires a margin of about 40%. That means traders may need to have substantial capital to trade this market. The recent price of bitcoin was about $7,350. The futures contract would cover 5 bitcoins, a total value in this example of $36,750. The margin required for trading is about 40% of that amount, or about $14,700. It could be more or less than that based upon market conditions and your broker. For this amount, you can enjoy significant gains if you are on the correct side of the market. As the chart above shows, the recent move of $2,735 in bitcoin would have delivered a gain of $13,675 to traders using bitcoin futures. Of course, it is unlikely to capture 100% of the up move but gains could still be significant if only part of a market move is captured. One benefit of futures markets is the ability to go long or short with the same level of effort. In the stock market, trading on the short side to benefit from an expected drop in price requires borrowing shares and carrying costs. That is not true in futures where short trades are simpler and often less expensive. “The average annualized daily volatility of Bitcoin against the U.S. dollar, over the past year, is about 90 percent. That implies, loosely speaking, that about one day out of every 20, Bitcoin will move by more than about 11 percent against the dollar. Now, there is no way to know whether the next big move in bitcoin will be up or down but there is a near certainty that there will be a big move. However, the chart below indicates a short term down move is likely given the readings in the stochastic indicator in the center of the chart and the MACD at the bottom of the chart. These are popular momentum indicators. Traders with a futures account could short one contract and use their stock holdings or Treasury bills for margin on the position. It is a risky trade but if short term trades result in gains, wealth could be compounded quickly. This is a strategy for only the most aggressive traders, as are many trades in the crypto space. But, given the potential gains the trades would be worth considering for some invetsors.